Clad in traditional Hawaiian dress, American River College dance professor Tyra Simoni gave a lecture on the art of Polynesian dance. 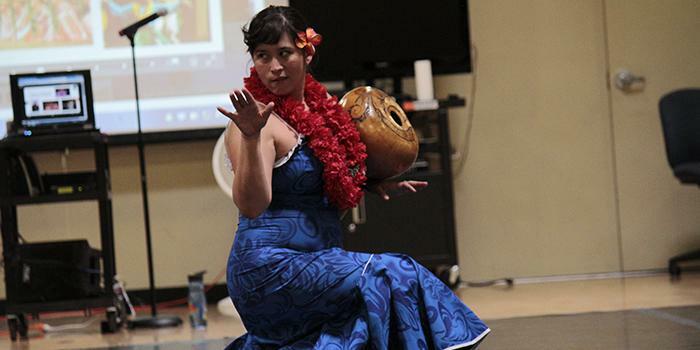 The hula, the “language of the heart,” was the theme of the last college hour of the spring semester Thursday. Powerful music and chanting go along with delicate choreography in hula dancing, and the audience was eager to learn the movements. Simoni gave a colorful powerpoint presentation noting the history of the Hawaiian hula, Tahitian and other Polynesian folk dances. She also toted two large drums and showed her own advanced skill of the dances to the audience. “I perform with Aloha Polynesia, a group that I share with my original hula dance teacher Cheryl Cook, and we perform at community events all over Northern California and sometimes we travel outside the country,” said Simoni. Simoni explained that several different waves of colonization has allowed for hula to be reinvented a few times over the course of history. With the birth of cruise ships came a huge wave of tourism to Pacific Islands, especially to Hawaii. This led to tourist-centric changes in costumes and the lyrics of hula songs to be performed in English. Simoni encouraged the audience to try the basic moves of the hula along with her. She instructed the group on how to swing their hips to the music. They ranged from young dance students to older couples. Simoni also emphasized how important hand placement is in hula because the hands represent the history that is told with the dance. If the hands are placed in the wrong area, the dance misrepresents the historical aspect of the dance, and another message may be conveyed. In addition to the history of hula and dance lesson, Simoni also gave some background into the use of base drums to create the beat that many Polynesian dances follow. She was able to play the drums and sing simultaneously, and called a volunteer up to play the drums while she demonstrated the dance. “I came here for the dance credit; I didn’t know there would be drumming, but I threw myself into it,” said Zack Tucker, a dance major who volunteered to drum for the audience. Simoni noted that there are actually several different Polynesian dance clubs throughout California, especially Northern California, and many give local community shows that are free to view. A show called Tahiti Fete, held at San Jose State University, features different dance groups who attend from all over the country, including guest artists from Tahiti and Hawaii. This year, it takes place from July 10 to 12. Polynesian dance is offered at ARC in the fall semester, and will pick up again later this year. Be the first to comment on "Dance instructor kicks off Pacific Island Heritage month with a history of the hula"